I have recently been able to understand and let go of the expectations that were causing me pain in my life! Wouldn't you love to do that too? I have realized that the values I hold for myself, and those you hold for yourself, color our experiencing of others in the world. So when we realize the filters we have on our perception, we can more easily see around those filters. Let me set this up with an example. I am definitely a "man of his word" kinda gal. If I say I'll do something, I will. If I'm part of a group, I am not a bystander. I volunteer, get involved, take action. And, I know when others say they'll do something and eventually don't, I can end up feeling disappointed, betrayed, even rejected. But, let's face it; we're not all alike. We have different strengths, different values, different life paths that have brought each of us to any given shared moment in time. So to expect someone else to be experiencing life as we do, or having the convictions that we do is both unrealistic and unreasonable. Expectations and judgments are filters through which we experience self and others. Although the expectations and judgments vary, this topic comes up frequently when I'm assisting someone in a Perspective Reboot® intuitive energy healing session. People don't react the way we expect they would/could/should because THEY ARE NOT US. Given the exact same path that we have had, they still may not react the way we would for a variety of reasons. But what if they are simply unable to? What if they don't have the same soul components (empathy, good will, determination, honesty, compassion, etc) as we? What if it's not even a choice for them? We're all unique aspects of Source Energy, as individual as our fingerprints. Let go of expectation that anyone is going to experience the same situation as you would. In my given example, I cannot expect everyone or perhaps even ANYone to do what they say they will just because this is a key component of MY nature and important to me. I can only be certain that if I say I will do something, I WILL. The other(s) is/are not in my control; only I AM in my control. Yet if there is something I truly need from another, I can ask directly for it. I will be happiest if I can also release the expectation and emotion that they will always deliver. That's the hard part, I know, but consciousness is power! Letting go of expectation is easier from a space of love and compassion and respect that we are individuals. It can also provide a foundation from which to express ourselves more fully to others ... express our needs and ask for what we want ... in essence, communicate more deeply. This gives the other the choice to provide us with what we need or the space to say "I am unable/unwilling/don't want to do that". We can be so much happier and less encumbered without the weight of our own expectations. Think about the myriad ways you can apply this to your relationships ... past-present-future! 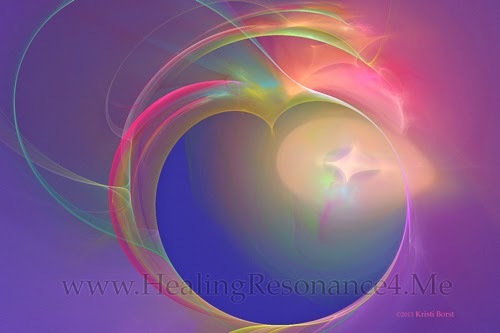 The image accompanying this article is "New Dawn" on royal background ... one of my "Energy-In-Form" Art Prints ©Kristi Borst, all rights reserved.